This is my first effort to write a travelogue. While I start penning it, am not too sure of whether this will get published, firstly because, while I am a frequent visitor to the site but I have not made any significant contributions. Secondly, this was no self driven holiday. What prompted me to write this travelogue was the lack of info on the yatra on the portal. Whenever heading out for a vacation, I do refer to the various travelogues and the rich repository of info on the portal. 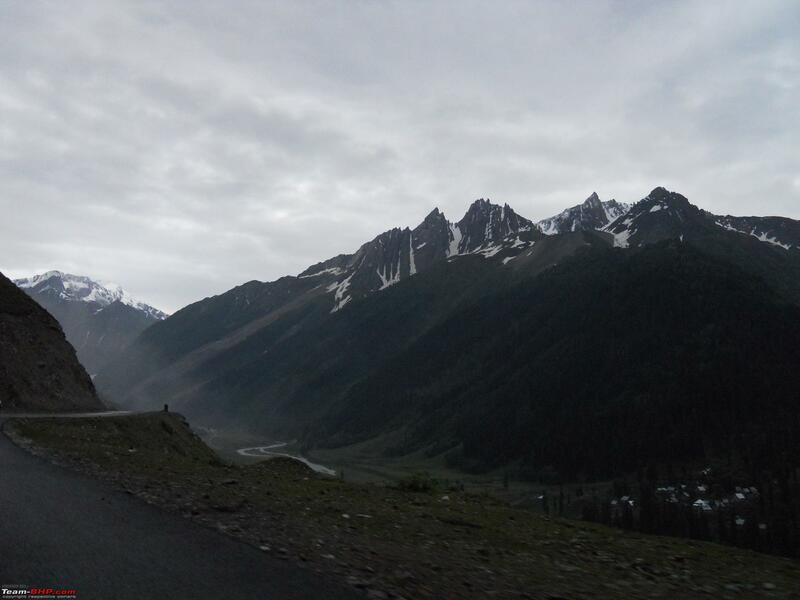 This travelogue is a small effort to contribute to the repository and to make available info on the yatra incase a fellow bhp’ian undertakes the trip. 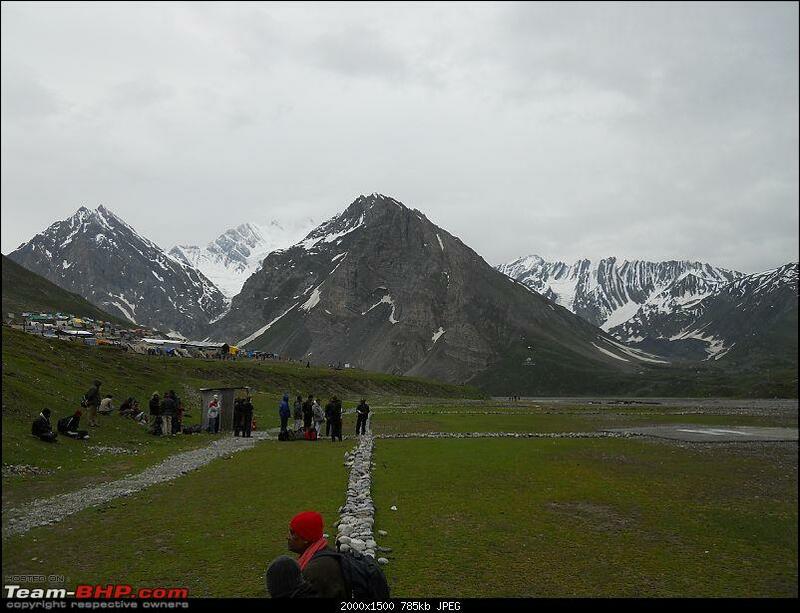 It all started one day in May 2011, came across a few write ups that spoke about the start dates of the Amarnath Yatra 2011. All these years I had read numerous articles on the same but the thought of undertaking the yatra never came across my mind. 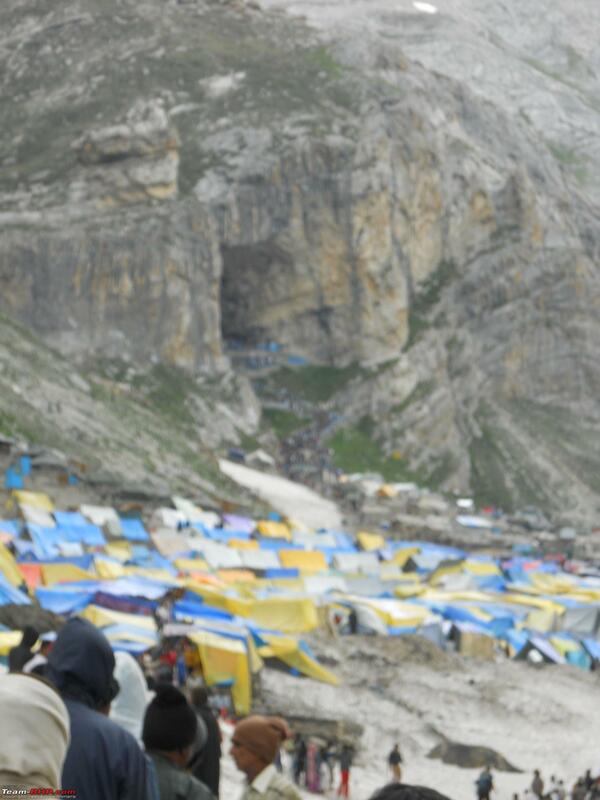 Did some check on the net to figure out the quickest possible way to undertake the yatra. 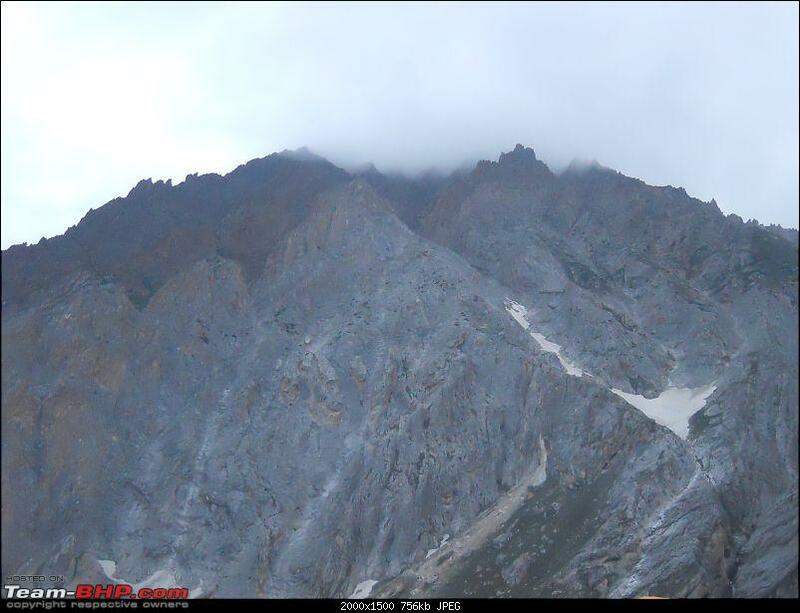 Also checked the website of the Amarnath Shrine Board. My sight fell on the ‘Helicopter Service’ mentioned there. Dug deeper in and found there were three chopper companies operating flights for the yatra. 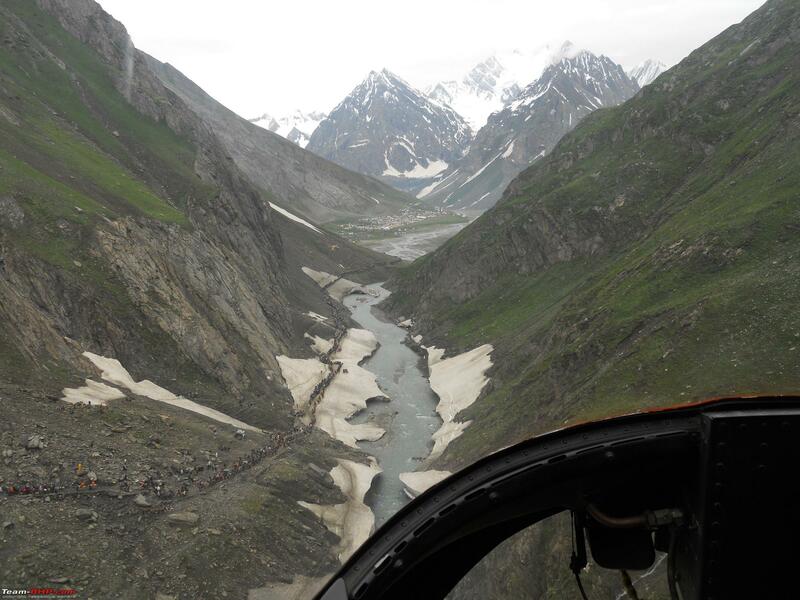 Pawan Hans and Himaliyan Heli Services operate on the Baltal – Panjtarni – Baltal sector while a new third operator, Global Vecta operates on the Pahalgam – Panjtarni – Pahalgam sector. The rates fixed by the Shrine Board for this year was Rs. 4,850 for a return ticket. 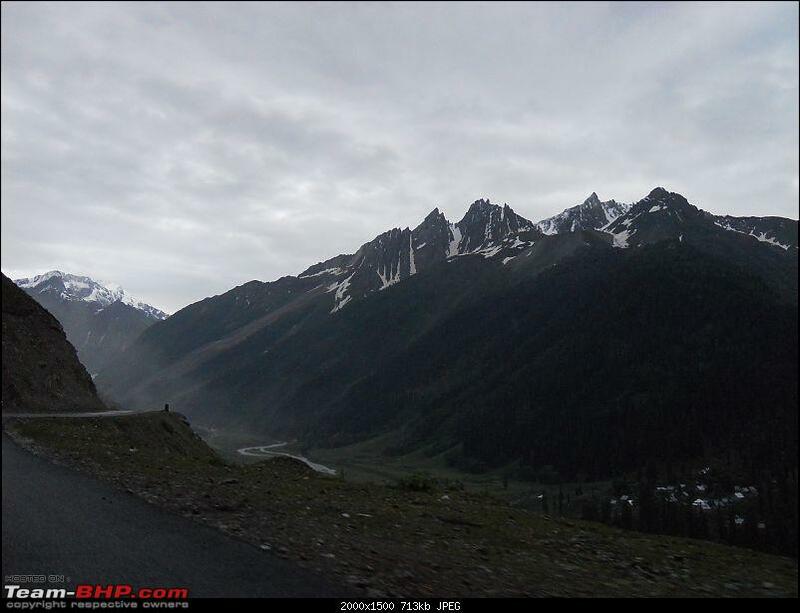 The ticket from Pahalgam (Global Vectra) is slightly more expensive. Since wify was busy with work and could not spare time, spoke to dad if he wanted to accompany me on the trip and he readily agreed. Actually, he got excited at the opportunity. Given his age, he probably would not have undertaken this journey alone. Well, since I have the luxury of 5 day working, decided to book the tickets taking advantage of the weekend and keeping my leaves to a bare minimum. The yatra was to start on 29th June 2011. 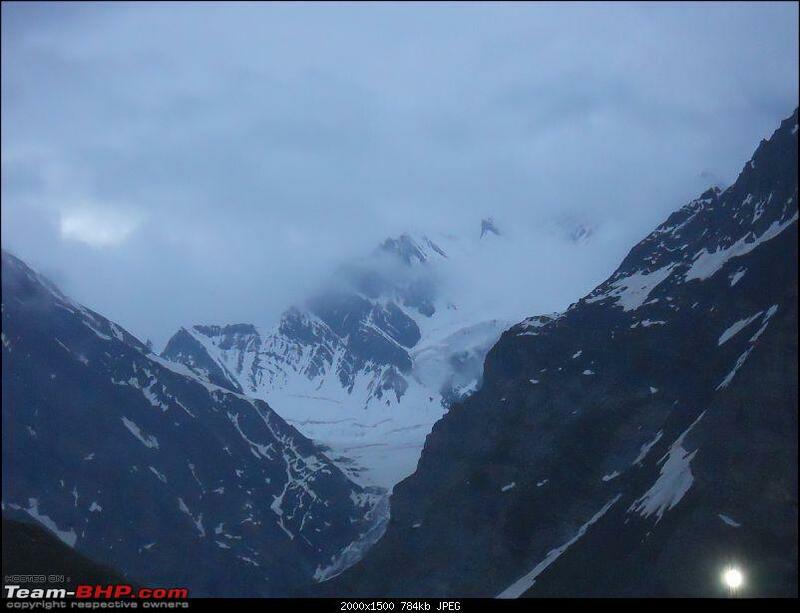 Planned a trip for 30th June to 3rd July 2011. While most of us work on water tight schedules, tried to keep the trip the same way but dad’s insistence made me keep the trip for 3N / 4 D instead of the 2N / 3 D as planned. This was a boon in disguise which I will talk about later. Just when I was about to book the chopper tickets, realized the all available seats through online booking have already vanished. The chopper booking started around 17th May 2011 and it wasn’t long before all of them got booked. 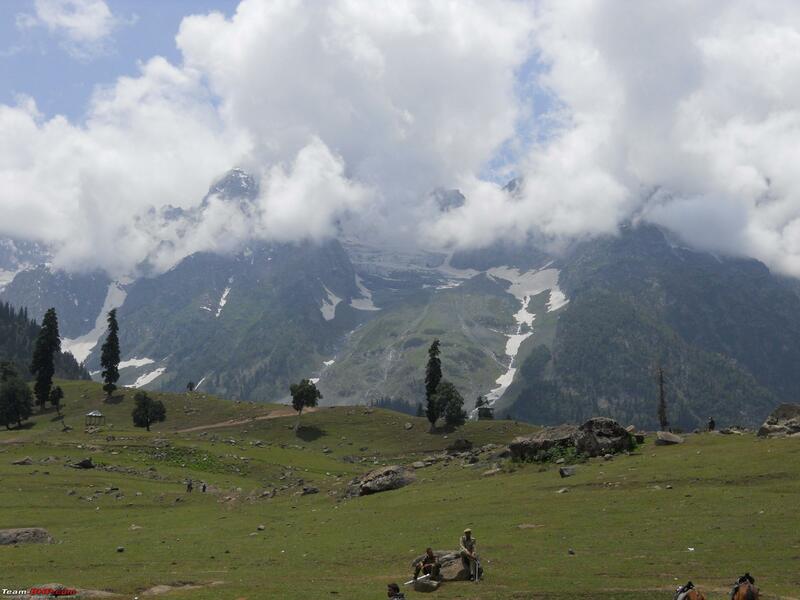 As per policy, 50 % seats are sold directly by the operator and the balance sold by the authorised travel agents, all of whom are based out of the valley. This was supposed to be my first chopper trip and I wasn’t willing to let go so easily. Then chanced upon a mailer from MMT advertising yatra package. Called them and post deliberations, cross checks and negotiations bought the package for 2 (including the chopper tickets, stay and sightseeing etc.) for the yatra. On 30th June landed in Srinagar and went straight to the Hotel. MMT had booked us at Hotel Centre Point. 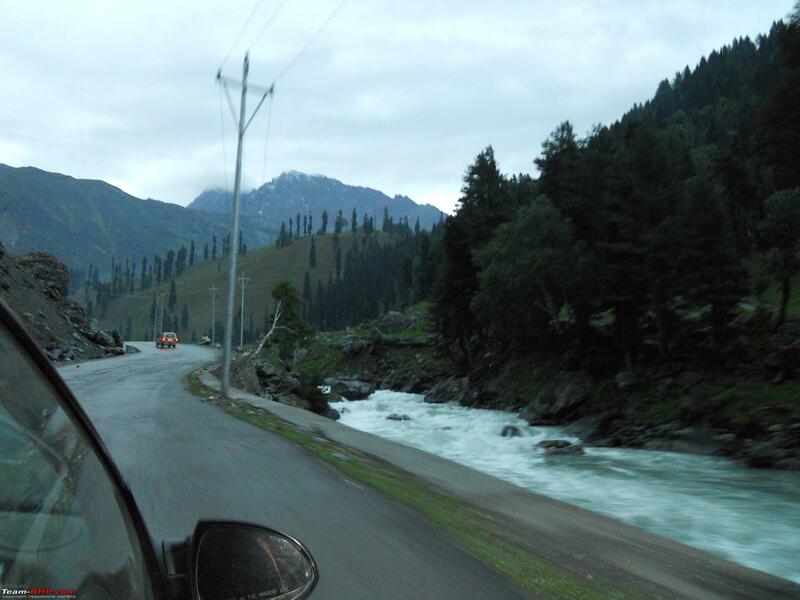 It’s a small hotel in Bhishamber Nagar, Khayam area and a 10 min walk from Dal lake. While on the face of it the hotel may not look imposing but is a fairy decent pad for stay as long as you do not expect luxuries and go with an open mind. The hotel has a lot of family guests and was running packed. The first day was spent lounging around and exploring the city. Reached the hotel in the evening, to be told that we must retire early to be able to go for the darshan the next day. 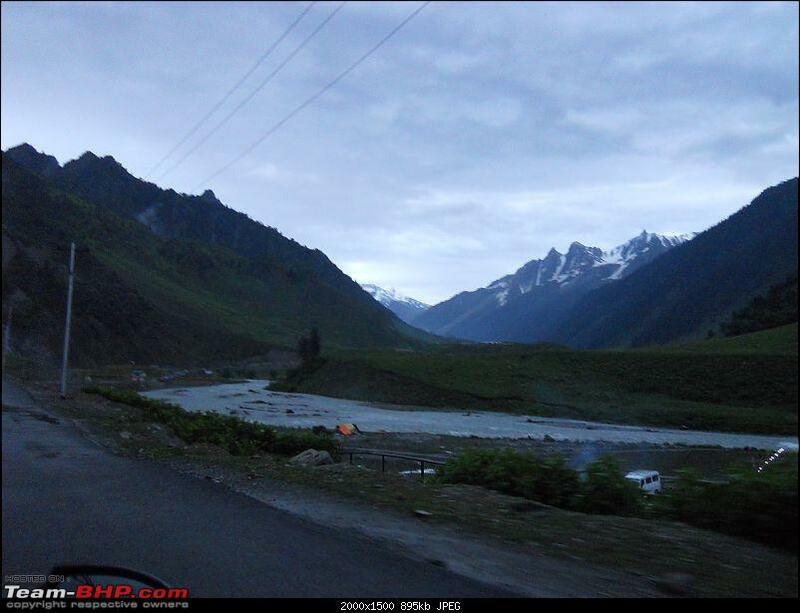 Baltal, the starting point of the yatra is 110 km / 3 hours* (* entirely dependent on the weather, road conditions, volume of traffic etc.) from Srinagar. The chopper services start at 6 AM in the morning. Our ticket was for the 8:15 am flight, but given the unpredictability of the weather and the traffic we were told to report early. 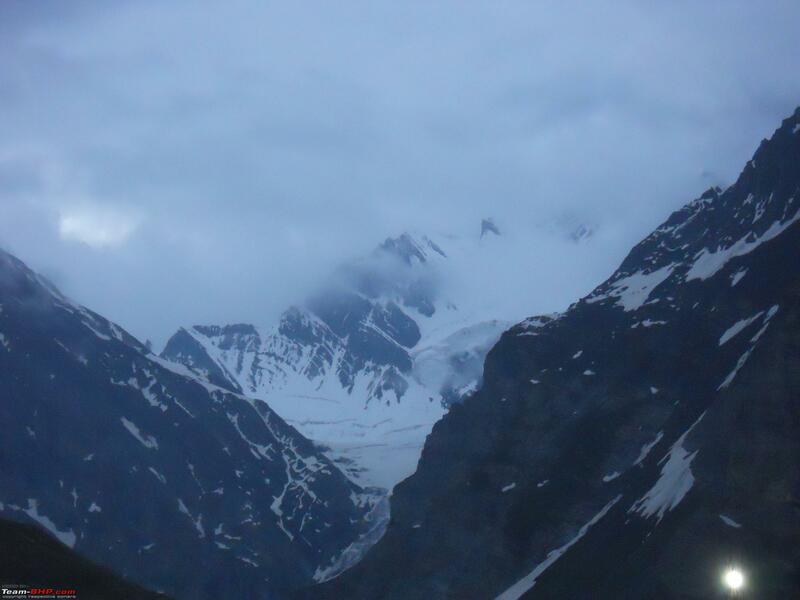 Got a wake up call from the reception at 2:30 AM and by 3:30 AM we were on our way to Baltal in our cab. The hotel was extremely efficient in pushing all the guests / pilgrims out of the hotel by 3:30 AM with reminder calls every 10 min. The hotel had provided for a packed breakfast to be had on the way to save on time enroute. 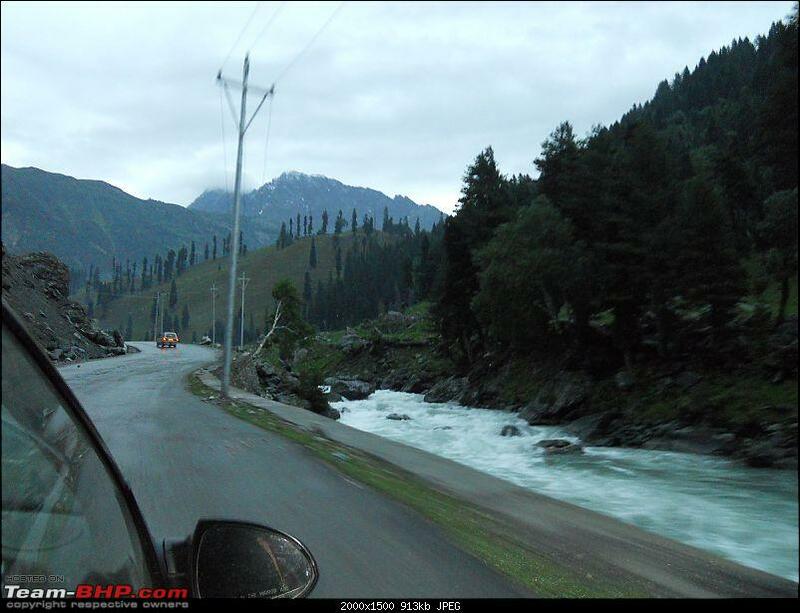 Traffic is regulated on the highway by the J & K police. While vehicles are not allowed to ply early, only vehicles carrying yatris with chopper tickets are allowed before the time. 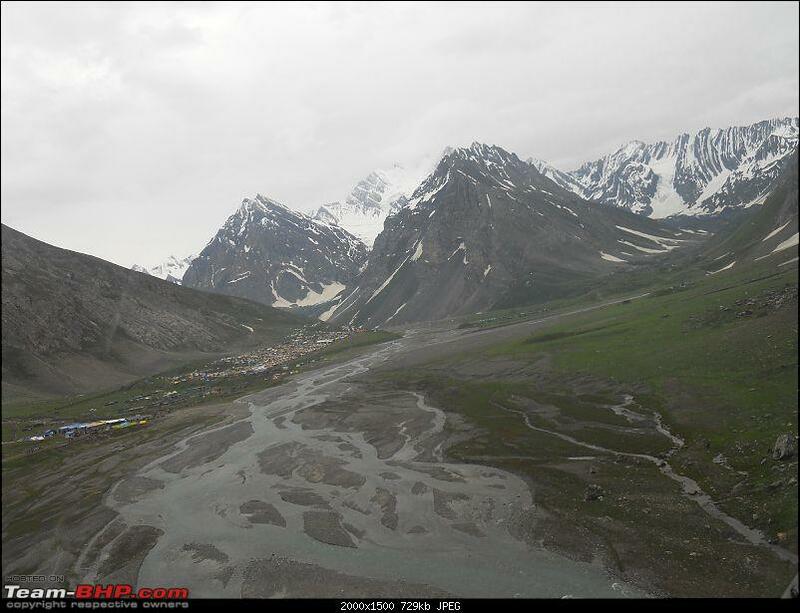 Showed our tickets at the checkpost and we were well on lour way to Baltal for the chopper ride. 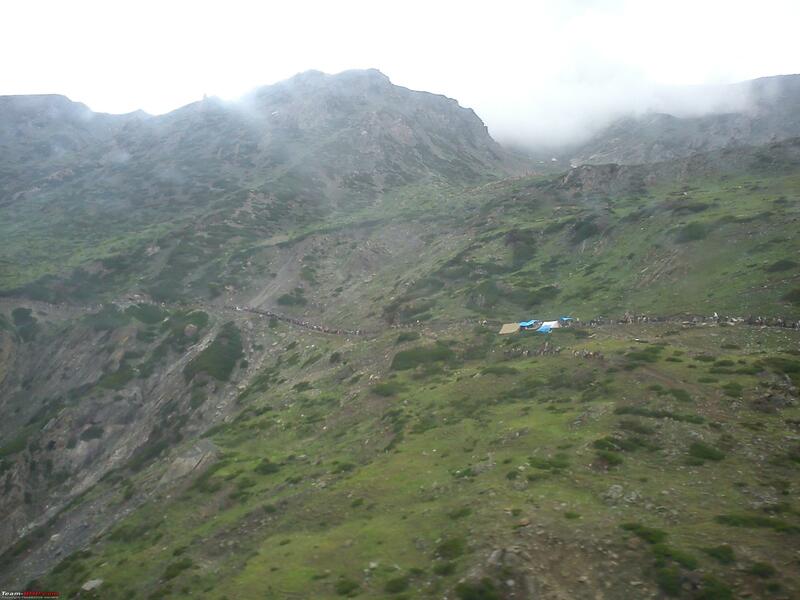 Reached Baltal and was amazed to see the ocean of humanity who had reached there for the darshan. Got excited to see the choppers being checked and warmed up for the day. 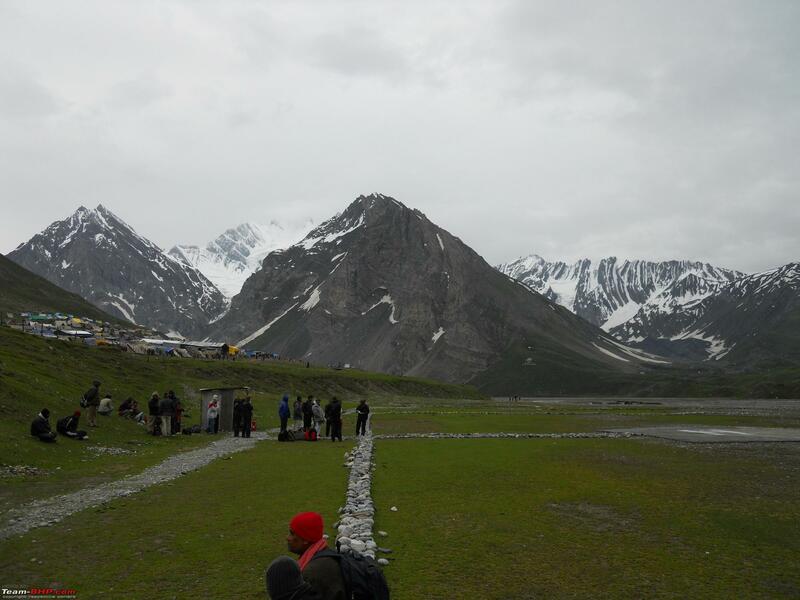 Needless to say, the security was really tight throughout with CRPF / Army / ITBP jawans dotting the landscape. This was to continue throughout the entire journey. Got the boarding passes and waited for our flight to Panjtarni. The chopper crew normally weigh each passenger with their luggage (only hand bags / laptop sized bags). The total weight per flight is restricted to 320 kgs. Finally, our turn came for the ride and was excited for my first chopper ride. Managed to get the copilot seat for the trip. Attaching a few pics from the forward and return journey post lift off. 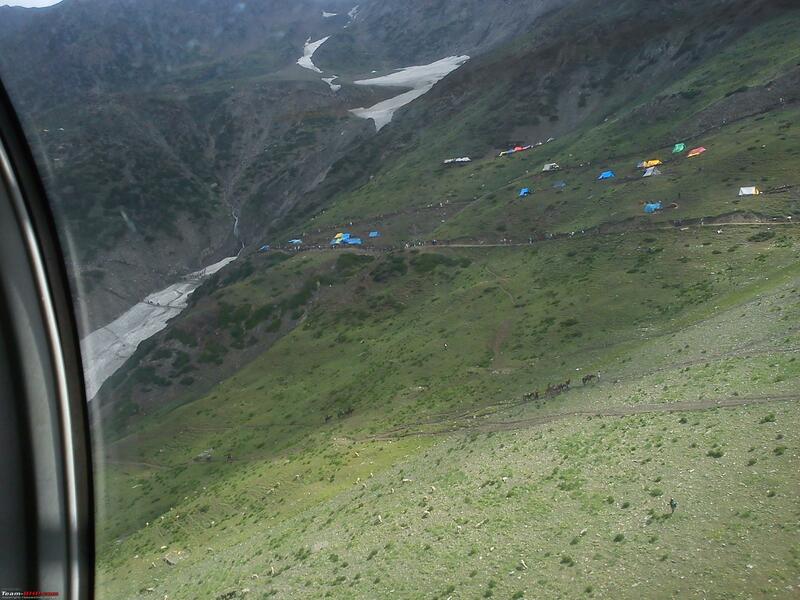 The chopper ride is all of 5 min from Baltal to Panjtarni. If you were to do the same on foot, the duration would entirely dependent on the volume of pilgrims, weather and the physical fitness of the pilgrim. Bisembarked at Panjtarni and straight away took a horse to the bhawan. While the distance to the bhawan is 6 km and can be covered in an hour on horse back, this too is subject to the weather and the volume of pilgrims. The track is narrow and unmetalled and allows for only one way traffic. So the movement is regulated in batches, thus it can be long before you reach the bhawan. Took us 3 hours to reach the base of the bhawan. Enroute you walk on slush, ice and glaciers. Not to mention the steep drops that you encounter through out the stretch. While the Shrine board has fixed rates for horse rides and palkis, the rates are thrown to the wind. A palki ride can cost you as much as Rs. 3,000 and a horse ride upto Rs. 800. From the base of the bhawan to the Shivling, there was a long queue of upto 2.5 km, but fortunately the same was organized and was moving at a snail pace. Took another 6 hours to reach the bhawan for darshan. The minute the shivling was in sight felt a rust of blood within and the entire tiredness of the journey disappeared. Also had the opportunity to see the pair of pigeons that are very much a part of the mythology and inseparable from any reference to the Amarnath yatra. 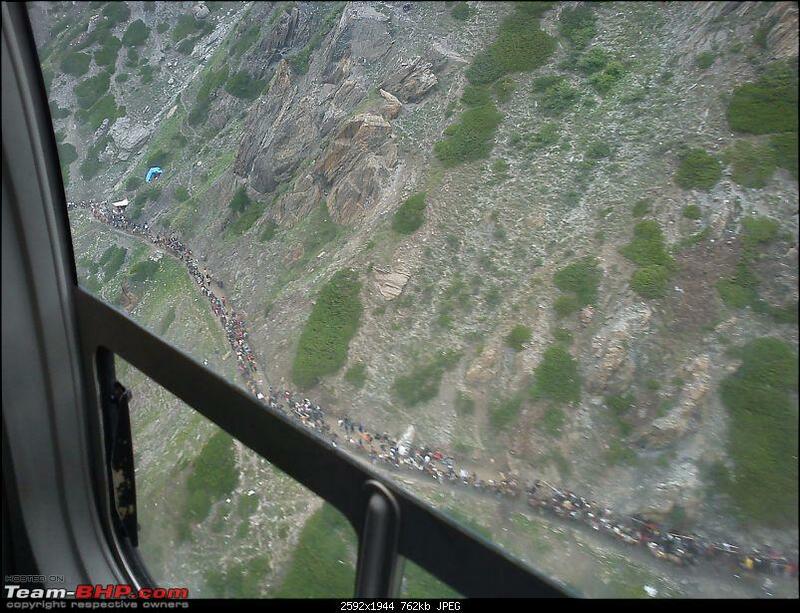 Normally, people target same day return to Baltal (on helicopter) post darshan. But that’s wishful thinking. The helicopter service operates till 6 PM in the evening but is subject to the weather conditions. Was informed that the previous day, the service operated till 7:30 PM owing to excellent weather. 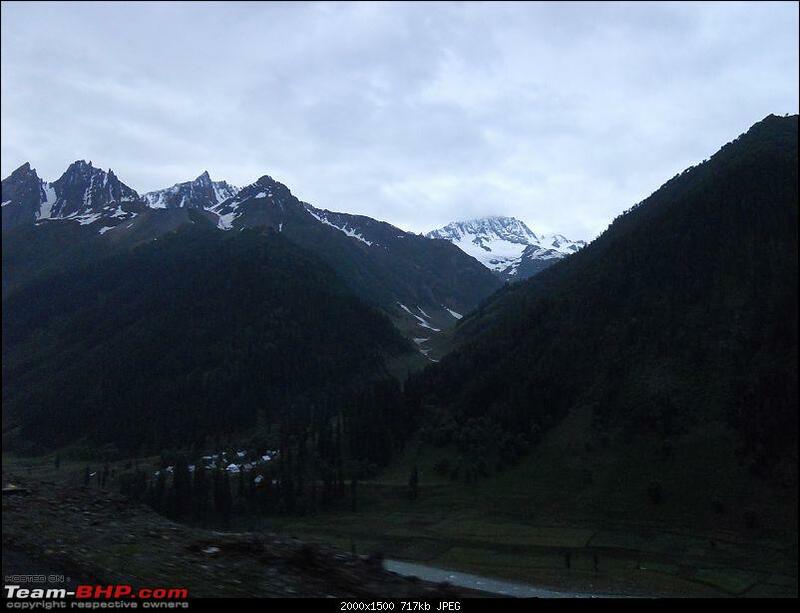 During the darshan, the weather deteriorated and it started raining. This meant that return to Panjtarni was not sure and also the return to Baltal by helicopter. 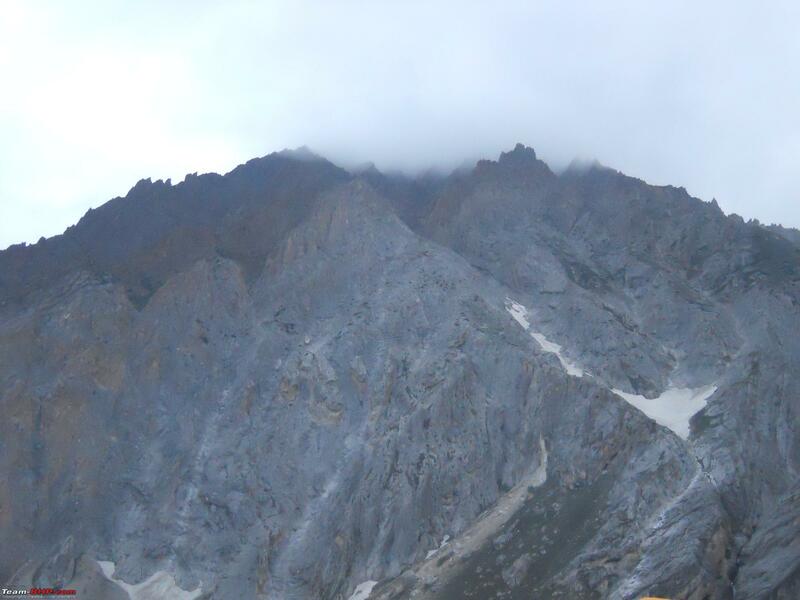 Also night movement of pilgrims to Panjtarni and Baltal (there are 2-3 routes to the bhawan, one directly from Baltal, one via Pahalgam and the third via Panjtarni). Since we managed the darshan by 6 PM we decided to go to Panjtarni rather than stay at the base of the bhawan to avoid the next day’s rush. All porters and horse owners return to Panjtarni for the night and thus it’s easier to get a horse on the way back. Reach Panjtarni by 7:45 PM and learnt that the Chopper service was suspended at 5:30 PM owing to the weather. This meant we had to spend a night at Panjtarni. Hired 2 beds in a tent (Rs. 225 per head) for the night and retired. Fortunately, the tent was further away and thus peaceful as there were no other occupants. Must admit that the people over there are fairly enterprising. While the products and services are sold at a very high mark up (given the difficulty and cost to make them available at that altitude) but you could ask for a hair cut, a foot massager (powered by a generator) and even a liquor bar. The tent was clean but the night was bone chilling cold despite wearing 3 layers of clothes along with a quilt. Woke up at 5 AM in the morning to head straight to the helipad for the return journey. It was already day break. At that altitude (12,000 + ft) sun rises early and sets late. Took a few shots and reached the helipad only to realize that the queue was long owing to the extra number of tourists who had to stay back because of the chopper service getting suspended early the previous day. Finally, got the boarding passes after much effort. The crew there were a harried lot with tired and cranky people eager to head back. 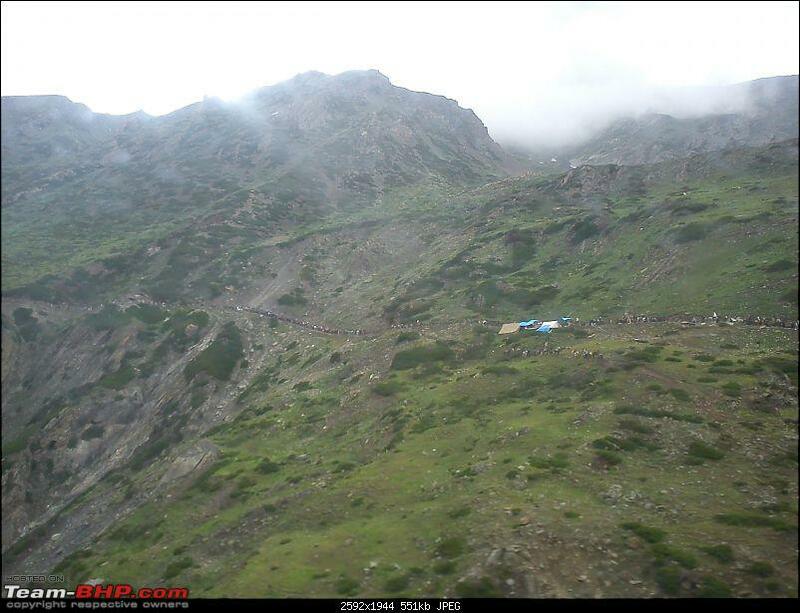 Came across a few pilgrims who were returning from Panjtarni itself (without the darshan) as they developed high altitude sickness and could not go further. Medical services were prompt and taking good care of the ill. Got a first hand experience after I gazed my hand on a tin sheet and got a deep gash. J was in and out of the medical centre in no time with first aid owing to the prompt service. Reached Baltal by 9:15 AM and headed back to Srinagar. Mobile phones (MTNL / BSNL / Airtel) came back to life. 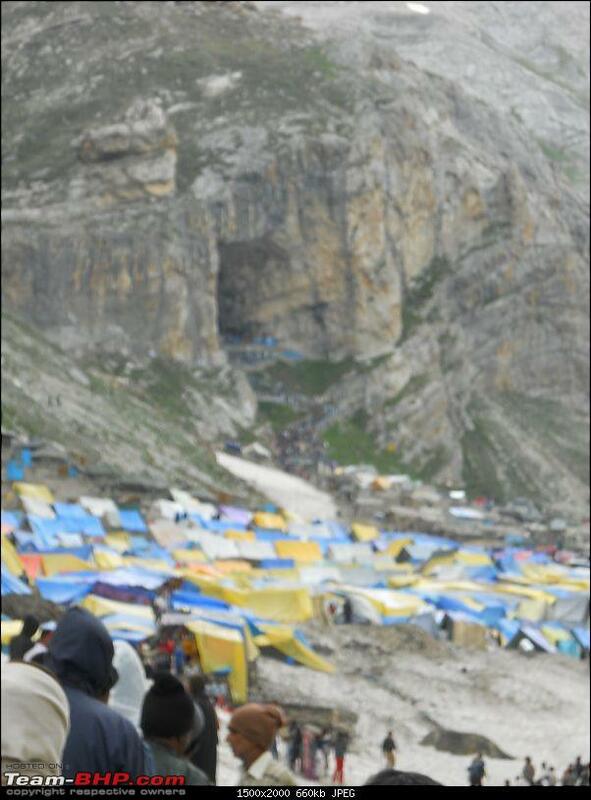 There were hordes of people waiting there to undertake the yatra. 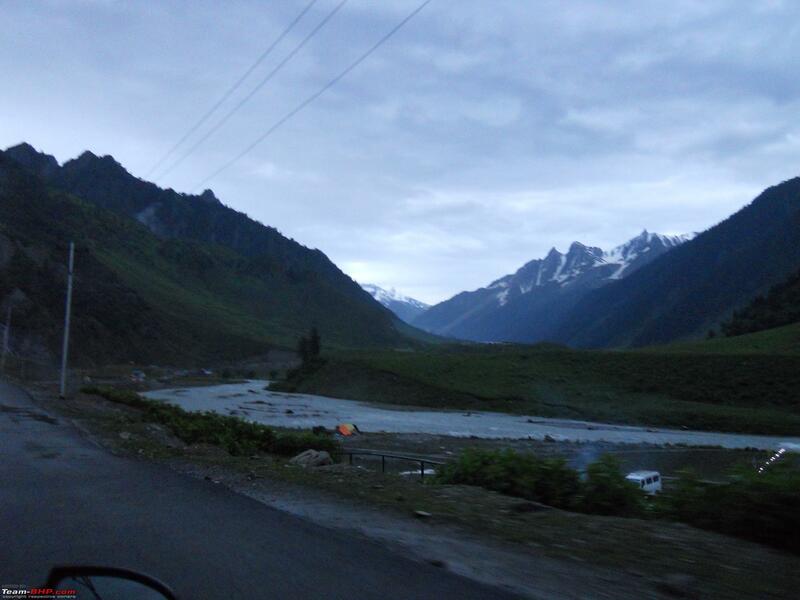 The return journey took us 6 hour owing to 6 km long jams (of people heading to Baltal) and reducing the traffic to a single file. During the prolonged stoppages, came across a few pilgrims who had already missed their flight. That’s when I thanked dad for his wise decision. Also, sighted quite a few NL, TN, AP…….phew registered buses carrying yatris for the darshan. Reached the hotel and spent the evening in the lobby chatting up with guests who were to undertake the yatra the next day and with guests who had missed their flight. The next day, headed to Shankaracharya Temple, Chashme Shai garden and the Pari Mahal (built by Dara Shiko, the Mughal emperor). The Pari Mahal garden offers a spectacular view of the Kashmir valley. Post which headed back to the airport for the return flight. 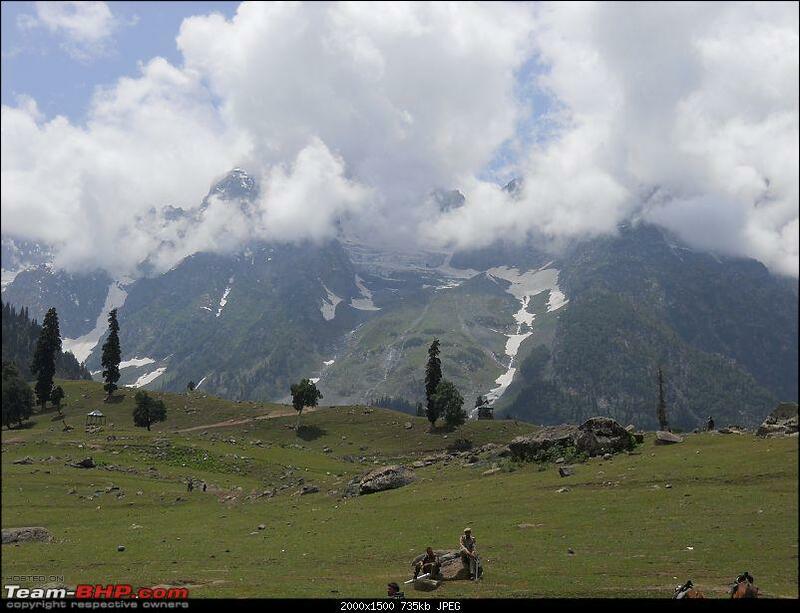 Could not go to Gulmarg as we returned from Baltal the next day. But was more thankful rather than regretful for the spare day that came handy. In conclusion, was glad that I undertook the trip, not just for myself but also for my dad. Thread moved to the Travelogues forum. Thanks for sharing! Thankyou so much for putting down the info. 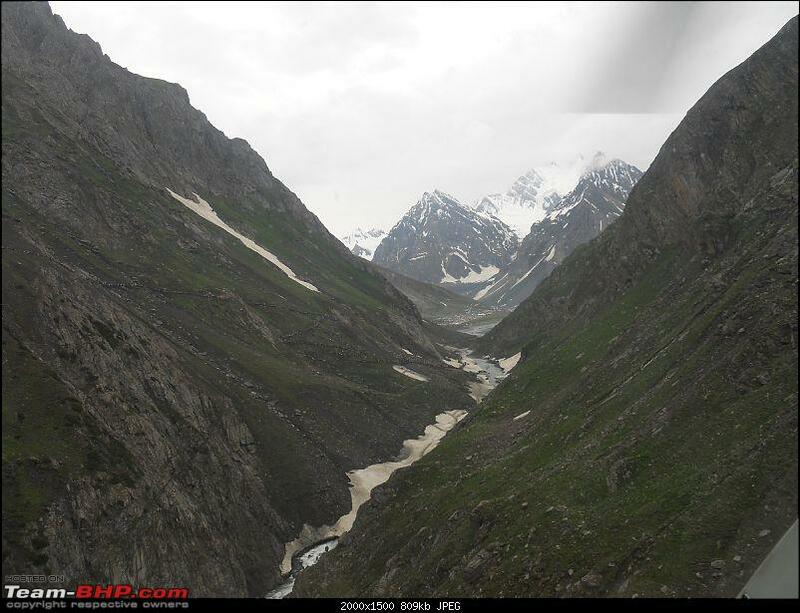 Incidentally I was searching for Amarnath info on Tbhp, and found this as the only one. 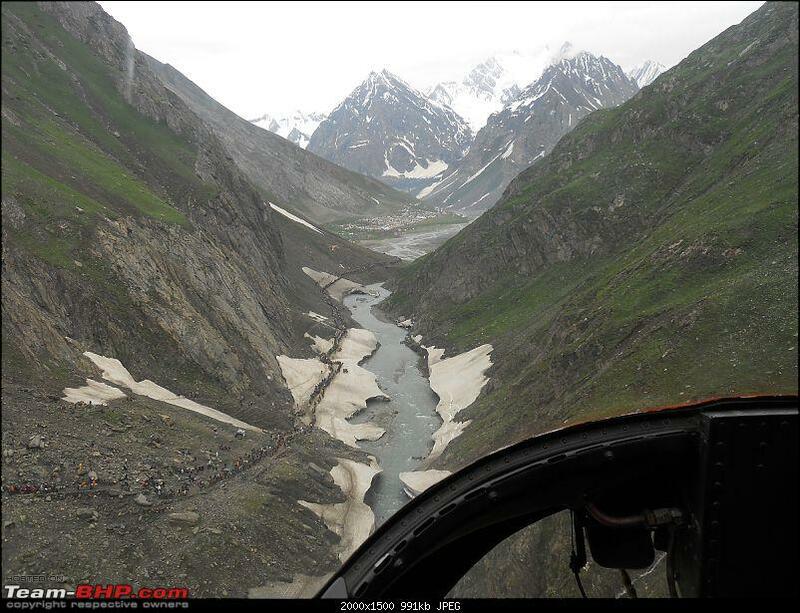 Pics from helicopter are really beautiful. Pls share few more. Can you pls tell how much distance is covered by the helicopter from Baltal ? and what kind of terrain this particular section is ? Because, I find even after using helicopter, you walked around 10 kms, further for the darshan. Wonderful pictures and excellent travelogue, enjoyed going through it. I loved that chopper ride part. What did the chopper ride cost you, if i may ask? @ Anoopap: Hi, Apologies for the late reply. 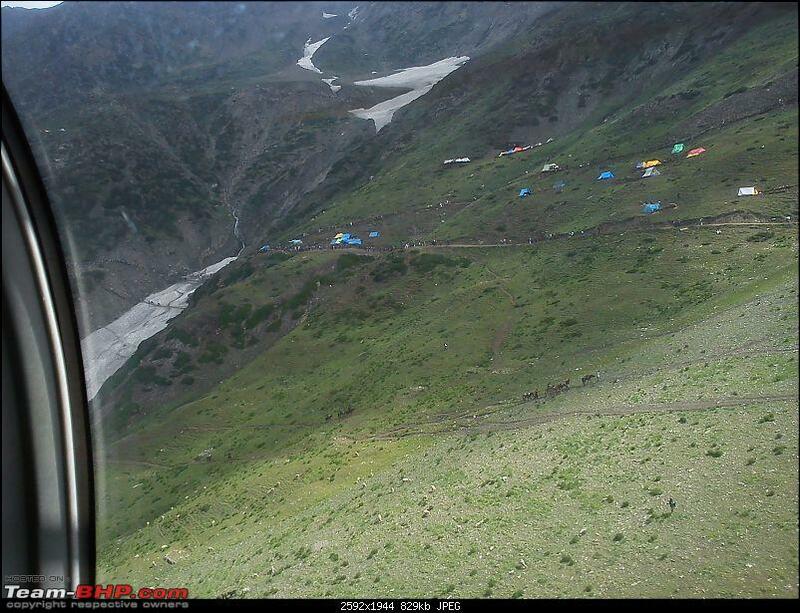 The chopper journey is under 10 min from Baltal to Panjtarni. 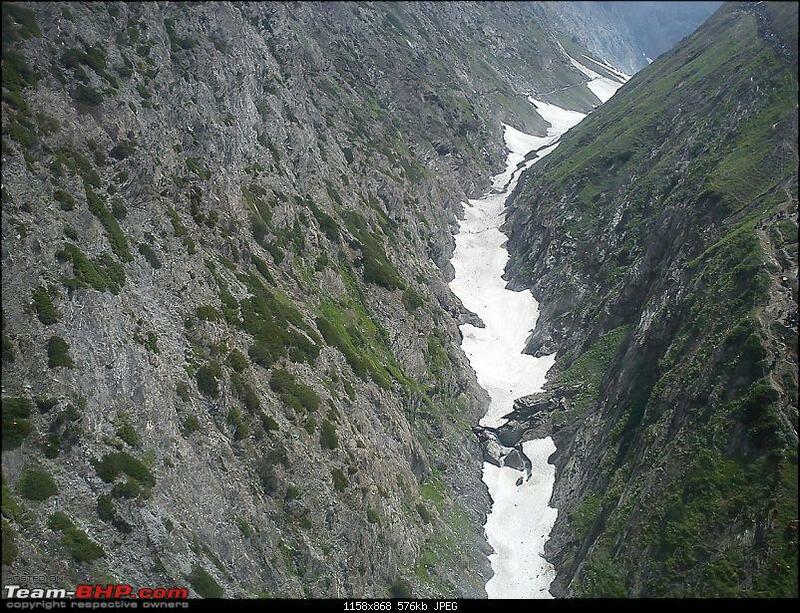 Wanted to click more myself, but photography is not permitted at the baltal end. 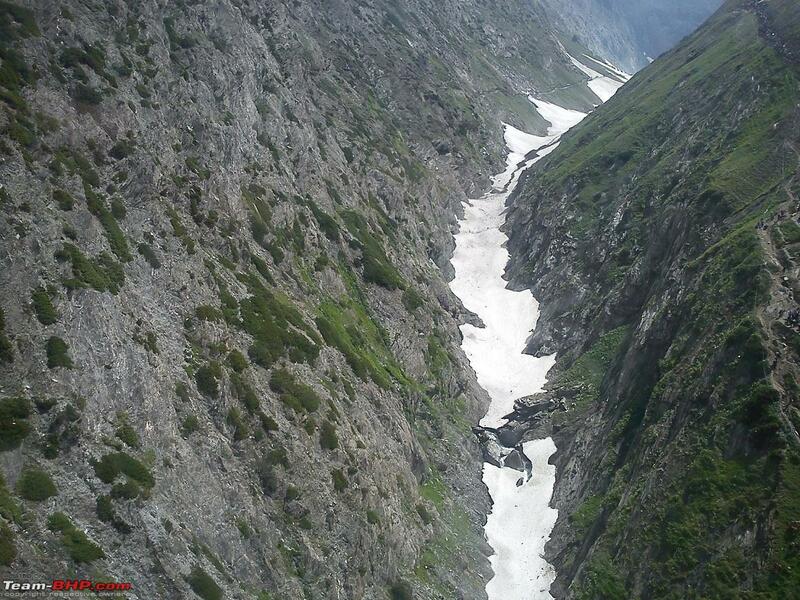 From baltal there are 2 routes, but this stretch can take upto a day to cover. weather can be unpredictable and so is the crowd, which only adds to the travel time. 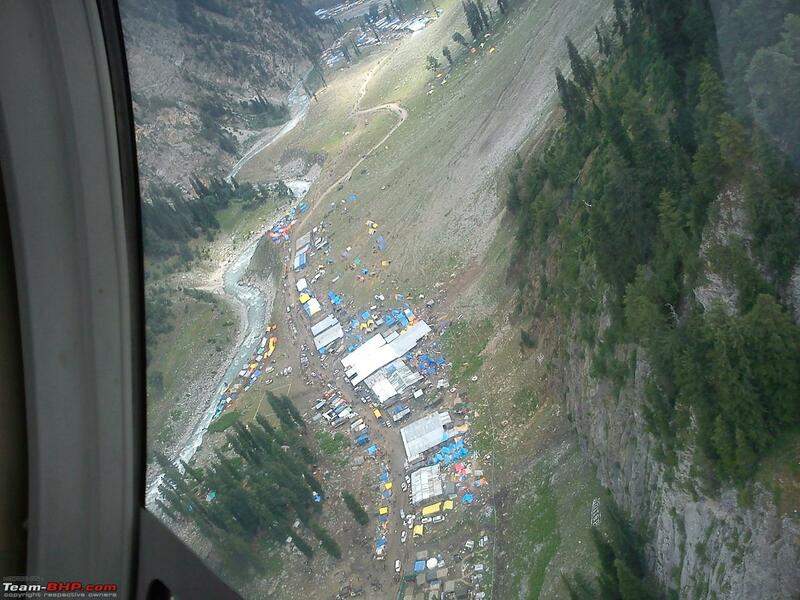 @Kartik: the booking for the chopper ride starts around mid May each year and the seats evaporate quickly. as a policy, 50 % seats are sold directly by the operator and the balance by the designated / authorised travel agents in the valley. this set of tickets are clubbed with a travel package and then sold. so if ur lucky to book tickets online / directly with the operator they cost Rs. 4850 (Pawan Hans, Himalayan Heli Services only). Global Vectra is slightly expensive as they operate from Pahalgamn. If you approach the travel agents........they're not as cheap. @ Amit Taneja. 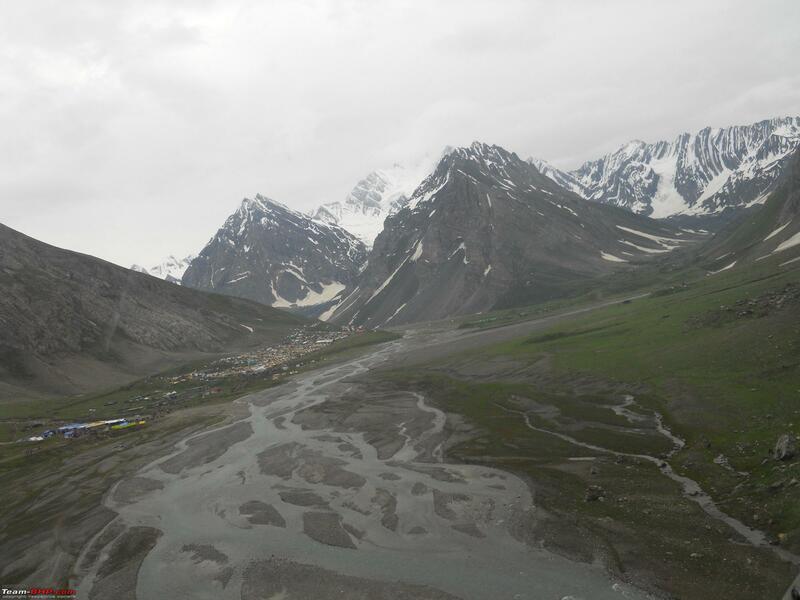 Just got back from Amarnath Yatra, done on foot covering both Chandanwari and Baltal routes on foot . Request your permission to merge it with your thread.